Six Ways to Prepare Your Child for a Dentist Appointment - Dr. G.S. Tatra Inc.
Every parent is anxious when it comes to taking their child to the dentist, regardless of whether it is the child’s first or tenth time. Bringing children to the dentist from an early age is important to help keep their teeth and gums clean and healthy. However, the feelings of anxiety that parents experience stems from the concerns of their child being uncomfortable and scared of the dentist. Thankfully, visiting the dentist and maintaining good oral health can and should be an enjoyable experience. Specializing in family dentistry, Dr. Sunny Tatra and the team are committed to creating the best experience for all clients, especially for new and young ones. By following these tips, parents can ensure that their child is positive about oral health and the dentist from an early age! Help your child learn about the dentist and teeth through storytime. Picture books are great at explaining visits to the dentists, with relatable illustrations and words that are easy for children to understand. Reading with your child is not only an enjoyable activity to do together but is also an effective learning tool. Children naturally follow their parents’ lead in everything they do. So, help start and reinforce a good oral health routine by flossing and brushing with them. When children watch their parents being diligent and happy about brushing and flossing, it will help to instil the same healthy habits. By flossing and brushing with your child, keeping oral health can become a fun activity to do together rather than a chore. To help your child become more comfortable with the dentist, pay a short visit to the clinic with your child before the first appointment if possible. Seeing and meeting the clinic and its team as a visitor rather than a patient will help the child feel more comfortable with the clinic and its dental team. Our bright and spacious clinic was designed to help create comfortable and welcoming experience for our clients. We understand how important it is for our clients to feel comfortable and at ease before, during and after their appointments and make every effort to create and maintain that environment. 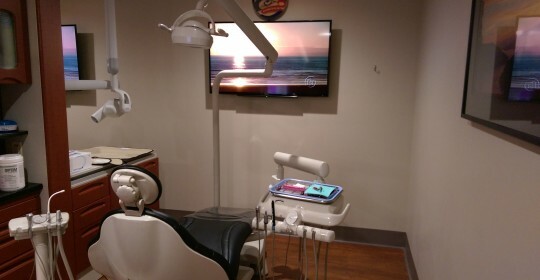 Take a look at a gallery of our clinic! Before the first appointment, play pretend as the dentist and patient with your child. Have fun taking turns doing some simple steps that dentists will do in a typical visit such as counting each other’s teeth, checking teeth and gums with a mirror, and rinsing mouthes with a cup of water. The child can invite their favourite stuffed animals or toys for an appointment as well. By acting out the dental routine, parents can help their child become familiar with the procedures so that he or she is comfortable for the actual visit. Be positive and encouraging about the dentist. Refrain from using negative words to describe the dentist such as “hurt” or “pain”. Because children look to their parents for support, parents who are positive and encouraging about the dentist help their child develop a good outlook on dental hygiene. Instead, use positive words such as “clean”, “strong”, and “healthy” to create a fun and positive vibe about the dentist. Technology makes visits to the dentists faster and easier, with new tools allowing dental teams to create a better experience for their patients. Advancements in technology mean that tools are smaller, less obtrusive, and faster in finishing their functions. Many of these tools can help patients, particularly children, become interested in their oral health by engaging them through their modern functions and features. Read about how Dr. Sunny Tatra and his team use technology to make dental appointments fun. By following these tips, parents can help prepare their child for the dentist and a positive outlook on oral health. Stay tuned for more blog posts about family and health as well as tips and news from the clinic! Remember to follow and like Dr. Sunny Tatra on Twitter, Facebook and Google+ to stay up to date with the latest news and tips! To book an appointment with Dr. Sunny Tatra and his team, phone +1 250 590 0166, email, or fill out the online appointment form!